The iPad is not a big smartphone nor a scaled down laptop. It's not really like any tablet that's come before it. And for this reason, it will delight users ready for something new, and confuse and upset people who expect it to be something old and familiar. If you buy an iPad, there's very little that you have to learn, and almost nothing you'll need to consult any sort of manual for. Everything is minimalist and uncluttered, with tools appearing only when they make sense. Most things that you'd usually do with a mouse and an Inspector panel are now performed by hands-on finger work. Touch a graphic object in a word processor and you can rotate, crop or mask it with your fingers using intuitive controls. Paint with your fingers but see results that look like a pencil or airbrush or wide tipped marker. Flick through videos as if they are pages in a magazine. 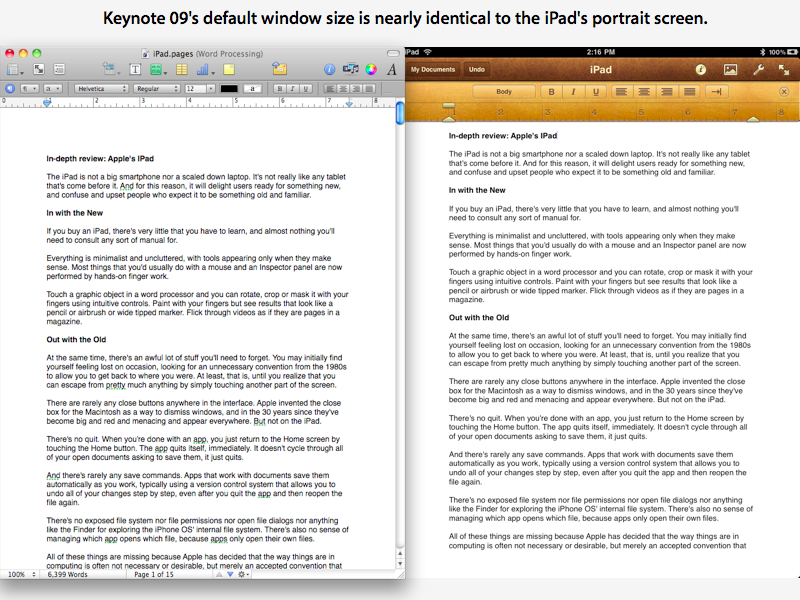 Apple's Pages word processor on iPad (which I used to enter all the text for this review) will probably look familiar to desktop iWork users (pictured opposite of each other, below), but it certainly doesn't demand any experience with the Pages 09 app in order to begin using it. At the same time, there's an awful lot of stuff you'll need to forget. You may initially find yourself feeling lost on occasion, looking for an unnecessary convention from the 1980s to allow you to get back to where you were. At least, that is, until you realize that you can escape from pretty much anything by simply touching another part of the screen. There are rarely any close buttons anywhere in the interface. Apple invented the close box for the Macintosh as a way to dismiss windows, and in the 30 years since they've become big and red and menacing and appear everywhere. But not on the iPad. There's no quit. When you're done with an app, you just return to the Home screen by touching the Home button. The app quits itself, immediately. It doesn't cycle through all of your open documents asking to save them, it just quits. And there's rarely any save commands. Apps that work with documents save them automatically as you work, typically using a version control system that allows you to undo all of your changes step by step, even after you quit the app and then reopen the file again. There's no exposed file system nor file permissions nor open file dialogs nor anything like the Finder for exploring the iPhone OS' internal file system. There's also no sense of managing which app opens which file, because apps only open their own files. All of these things are missing because Apple has decided that the way things are in computing is often not necessary or desirable, but merely an accepted convention that is often confusing and complicating in a way that adds very little value to most users, but saddles them with a level of complexity they needn't bear. This review will present an overview of iPad as Apple's vision of the future of computing, which rejects the notion that "computing" should force people to wrestle with lots of low level complexity, and which instead seeks to harness powerful technologies to make performing complex things easy for end users. Whether this vision will be well received and commercially successful is yet to be seen, but iPad is certainly set up with the perfect circumstances: it has achieved massive visibility, it is familiar to an installed base of 70 million iPhone OS users, it hits reasonable price targets, and it has a lot of big name developers adding value to it via the more than 3,500 new, iPad-specific titles in the iTunes App Store. The hardware form factor of iPad is quintessentially Apple, with minimal lines, few exposed buttons and switches, and like iPhone, no ports other than the standard Dock Connector. While it's commonly described as a "big iPod touch," iPad really looks a lot more like the top half of a small MacBook. It uses the same bright LCD screen as the new MacBook Pros, with "IPS" display technology for delivering accurate color and extremely wide viewing angles. It also sports the same glossy black wide margin around the display. There are only four physical controls: the Home and Power buttons, a volume rocker control, and a switch to lock the orientation of the screen to prevent it from shifting as you tilt it. This welcome addition will hopefully make it to the existing iPhone and iPod touch as well, if only in software. There's a headphone jack that supports the iPhone/MacBook integrated mic and remote control features (although no headphones are included in the box), as well as a built in mic and a decent quality (but mono) speaker grill that plays audio fully sufficient for enjoying a handheld movie or video game. Its weight (1.5 lbs, 0.68 kg) and density makes it feel substantial, although it can hardly be described as heavy given the fleet of Tablet PCs that came before it (and are promised to come after it), which are all much bulkier and often significantly heavier in the 2-3 lbs range. The back shell uses the same aluminum unibody construction Apple pioneered with the MacBook Air. This gives the device a strong, very rigid, and high quality feel. Unlike the iPhone, which can warm up quickly while making a 3G call, or a MacBook running at full speed that can threaten to bake your legs, I've never felt any suggestion of warmth from the back(or the front) of the new iPad. This thing runs cooler than a cucumber. 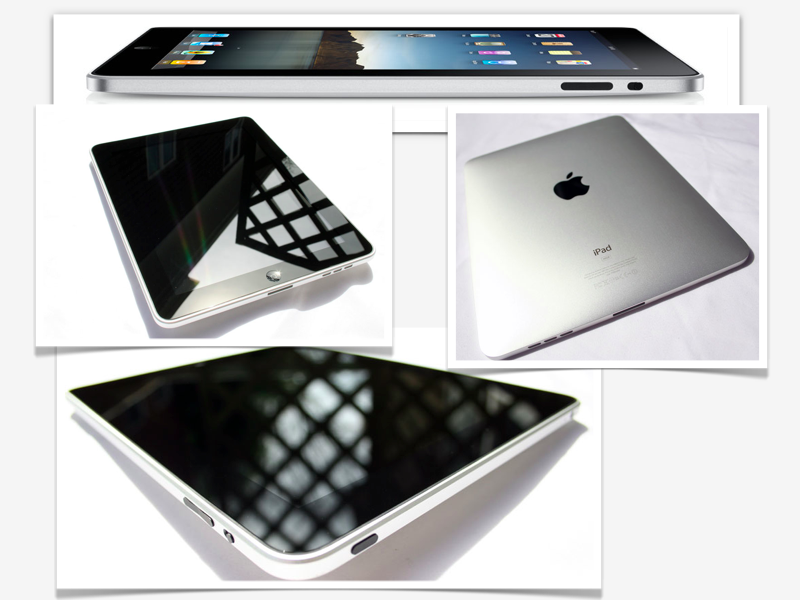 For a 1.0 product, iPad offers simply phenomenal construction, feel, and design. Of course, that's because nothing about it is really 1.0, but rather a series of refinements to Apple's existing products, from the iPhone OS to its MacBook construction. On page 2 of 10: iPad hardware: the battery; and iPad hardware: keyboards.